Heavy Light FZ is the first and already legendary suit in the Ursuit dry suit series. It is manufactured of a very light three layer fabric. Despite the lightness, the durability is of the highest possible standard. The series of Heavy Light suits was started in 1992, when a tender from the Swedish Defence Forces was received to trial drysuits over a two year period. The result being the Heavy Light suit was chosen and it has been in service ever since. Despite its military background, the suit is a dream come true for the sports diver. Heavy Light FZ is manufactured of a very light three layer fabric. Despite the lightness, its durability is outstanding. The durability of the material comes from its lightness – the fabric glides from sharp surfaces and minimizes wear and tear arising through friction. The patented seam structure, that is based on the Flat Seam-technology, makes the suit flexible and durable. The seam is taped both in- and outside. Because of this technology the multiple layers can be avoided and even the strongest and hardest materials can be sealed. You feel the difference immediately and after years of use. The suits comes with heat pressed shoulder, knee and back reinforcements and two large thigh pockets with D-rings. 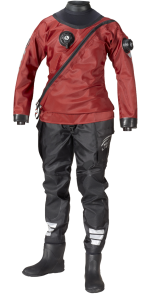 We recommend using X-Tex Finnfill thermal underwear together with your Heavy Light dry suit. Weight ca. 3,6 kg (size L). Wrist seals are made of latex. Bottleneck shaped with protection. Pockets for knife, light, (other than std), compass or map or thigh pocket.